If the artists or programmers say "no",then that's the answer. 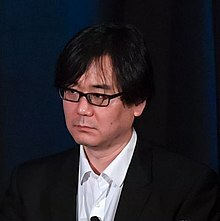 Hirokazu Yasuhara (安原 広和, born October 12, 1965) (also credited as Carol Yas) is a Japanese video game designer. So I come up with some ideas for the programmer to work with,and they decide what's good and what's impossible to implement,based on schedule or programming difficulty. These are all concepts. I make a lot of ideas and inserts.And this is what I just created. I don't write the map by hand anymore;I use illustrator instead to do the map.It has about five layers. I shrink it down by myself,actually.It's up to the schedule,so... If the artists or programmers say "no",then that's the answer. So it's kind of a mix. I always try to push a can-do attitude with them,you know? I always think about all the different elements of what makes something fun. This page was last edited on 30 July 2018, at 21:54.